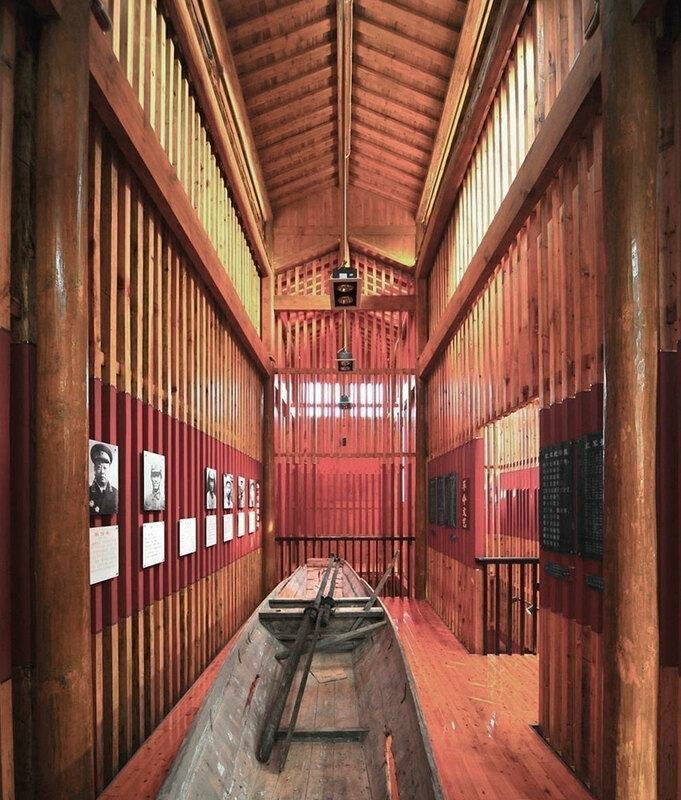 The Red Army Memorial Museum (丙安红一军团纪念馆) is located in the rural Bing’an Warf (丙安滩), a shoal in the middle of Chishui river, at the border between the regions of Guizhou and Sichuan, in South-West China. 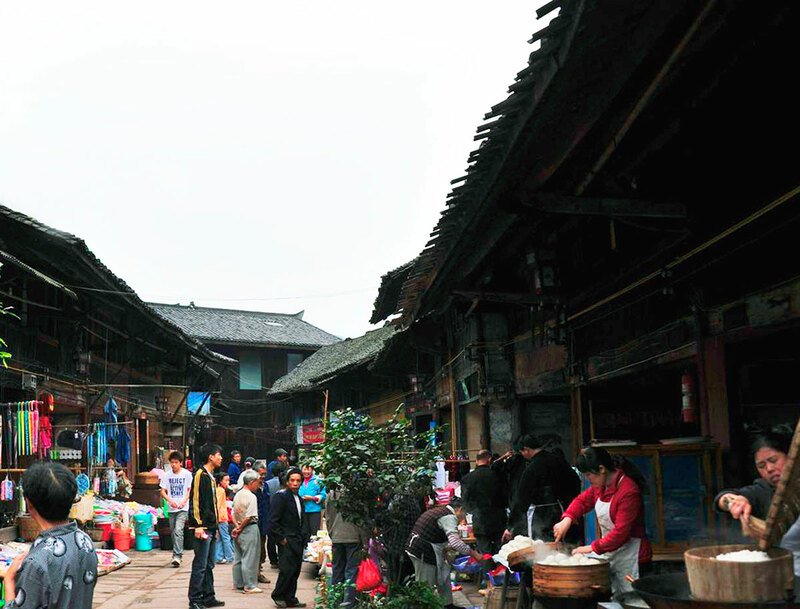 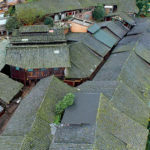 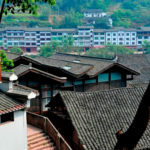 Nowadays the village of Bing’an counts around 700 residents and its long history dates back to the Ming Dynasty (17th Century). 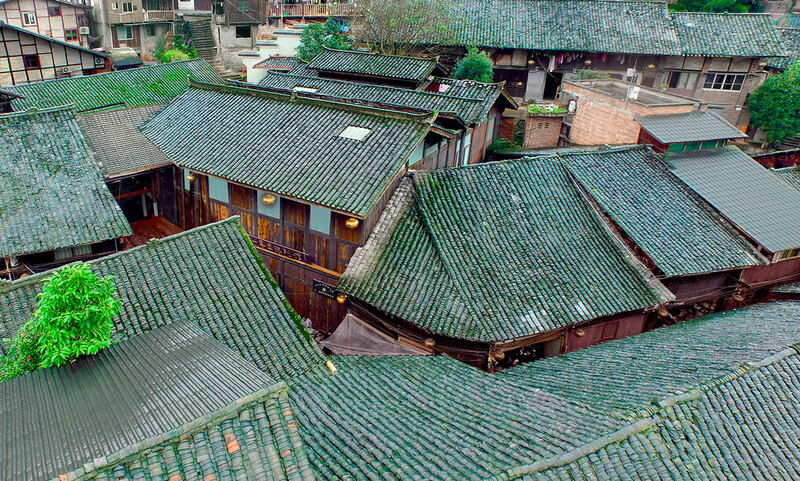 During Qing Dynasty (18th Century) it became an important business town and prosperous ferry terminal on the salt trade routes between Yunnan, Sichuan and Guizhou. 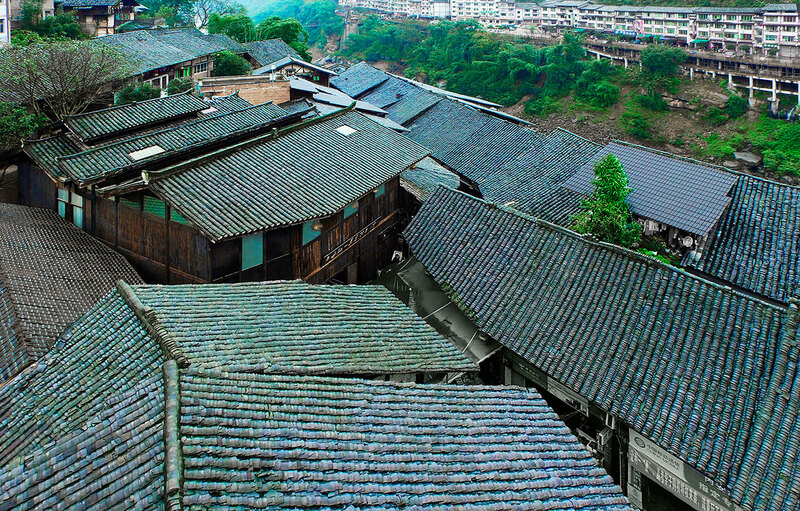 Bing’an is located on a deep ditch on dangerous cliffs, where there was not much flatland to build a proper town. 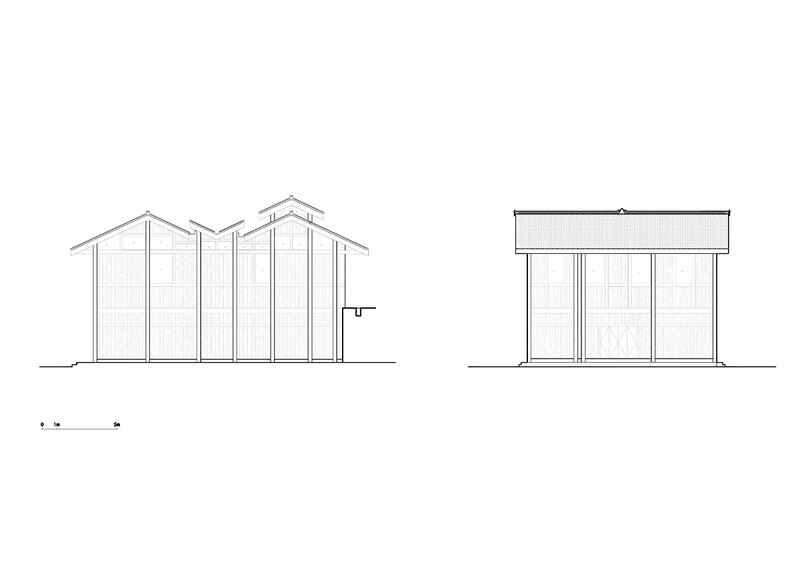 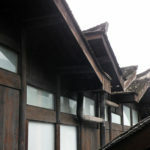 But due to this particular location, at a strategic junction between South-West commercial routes, the town has been developing its own architectural style. 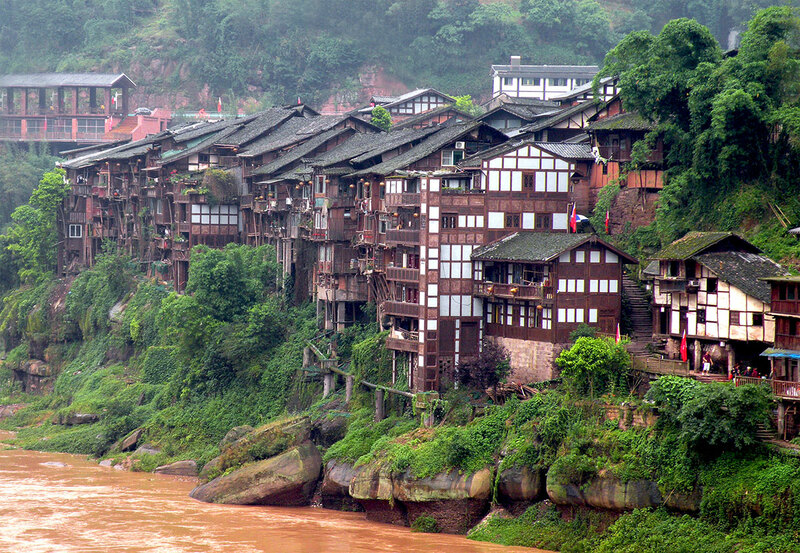 Hanging stilted wooden buildings, 20 meters higher than the river level, take advantage of the mountainous layout, using 60 degrees dig angle. 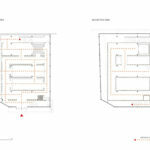 Bing’an master plan was arranged following a ‘fish-bone’ scheme, with a central commercial street cutting through the village. 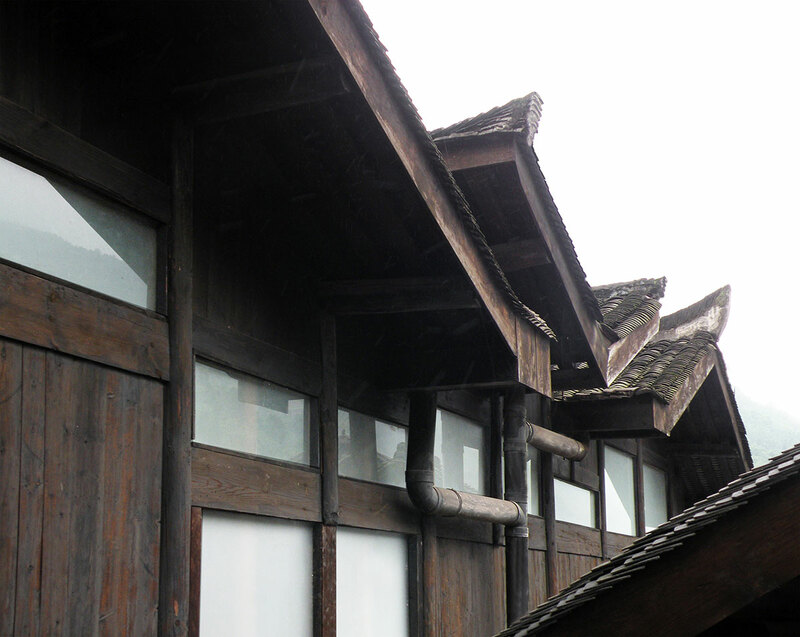 On this commercial street, at the very center of the village, West-line studio has been asked to restore a historic building to host the Red Army Memorial Museum. 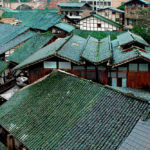 Due to the lack of maintenance over the years, architects found the building in very bad condition. 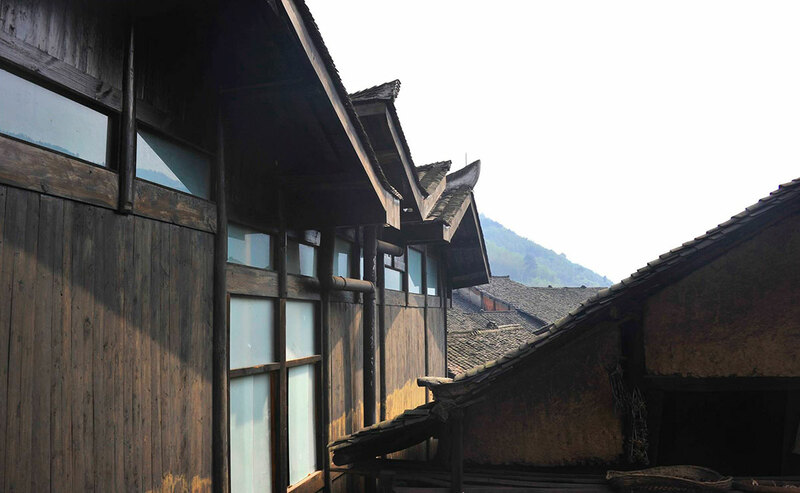 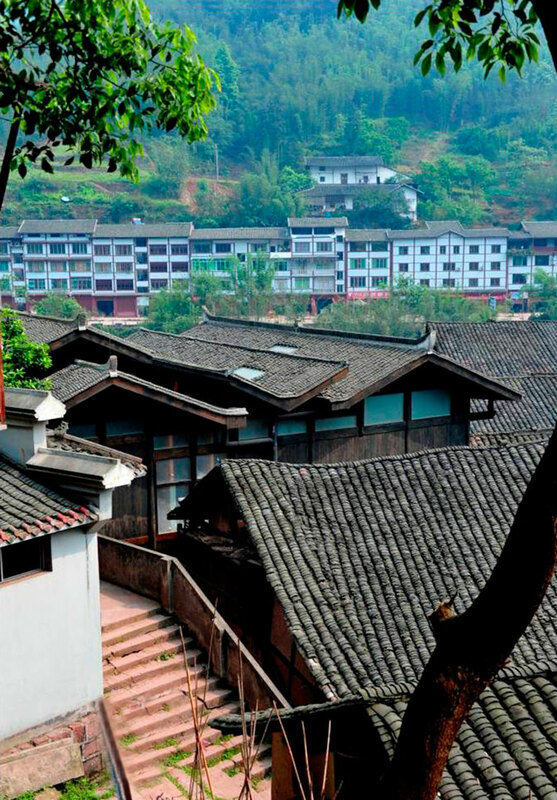 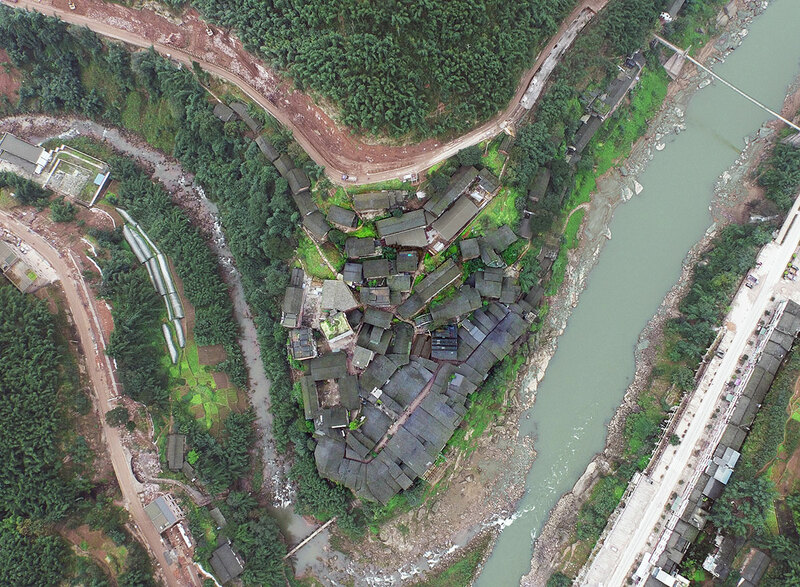 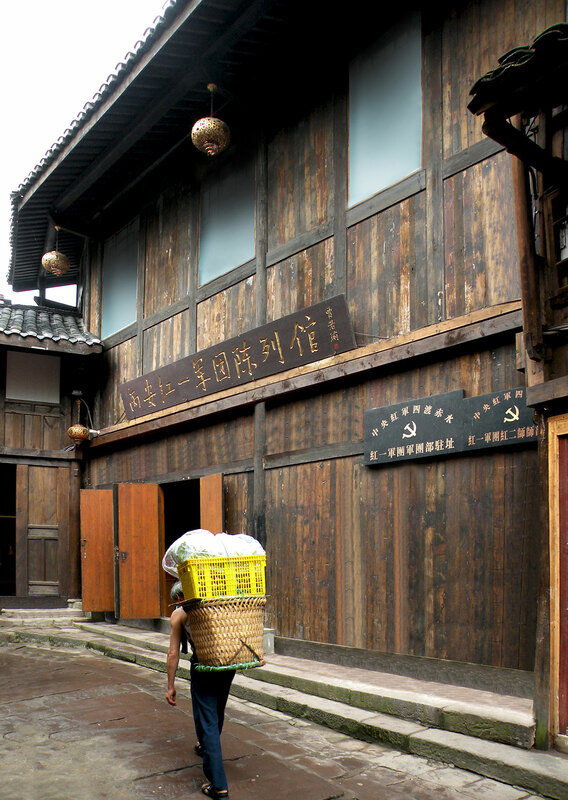 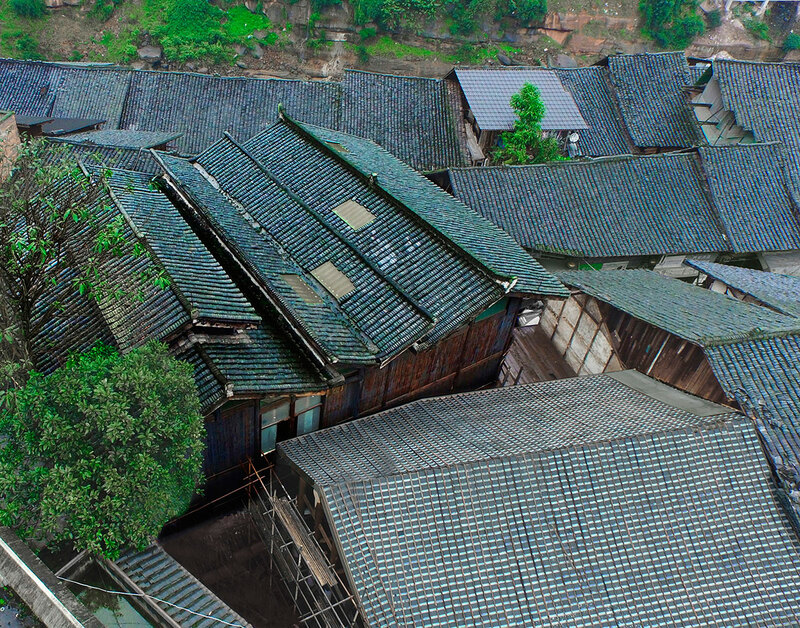 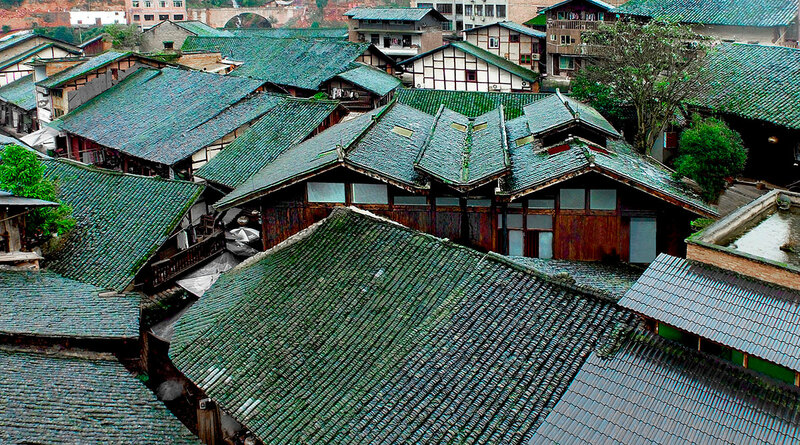 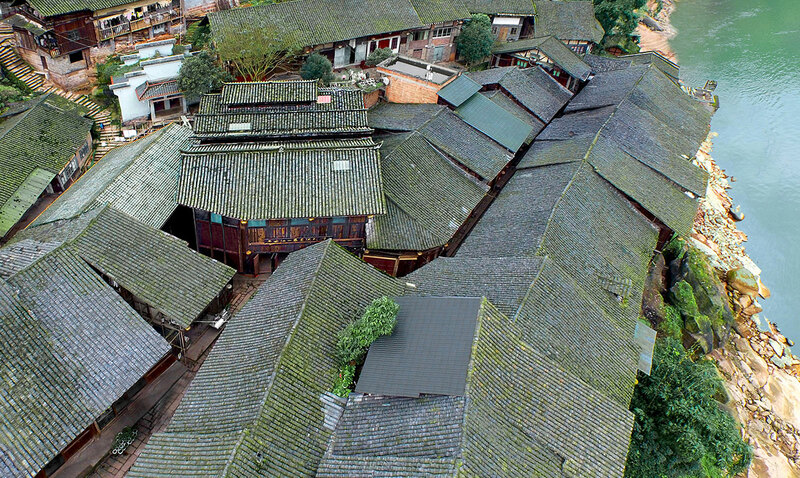 The whole building is made of wood, which is the traditional architectural style in Northern Guizhou villages. 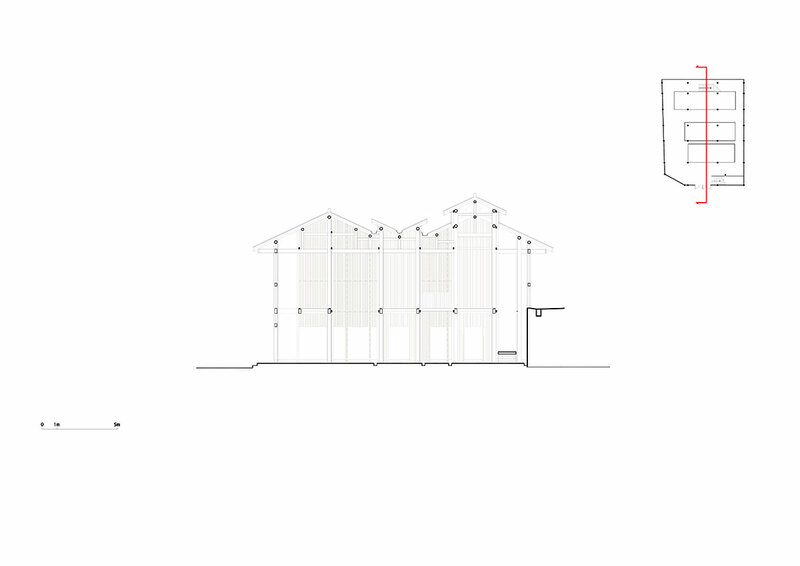 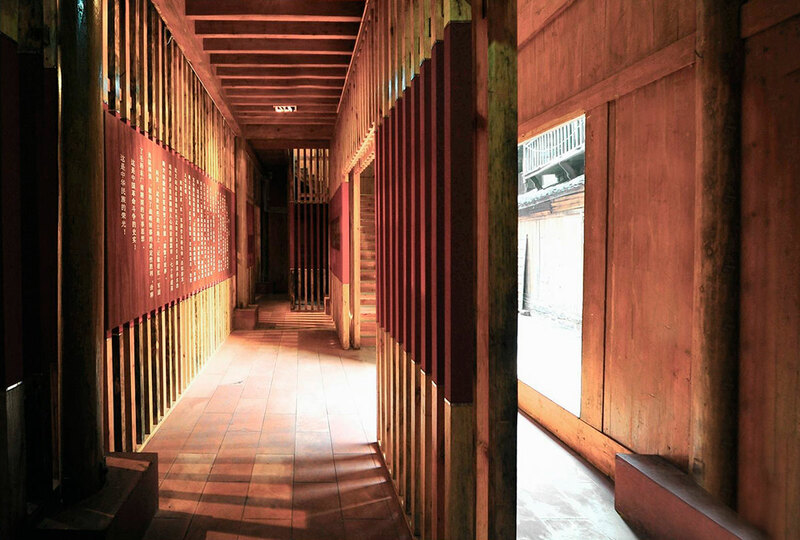 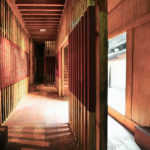 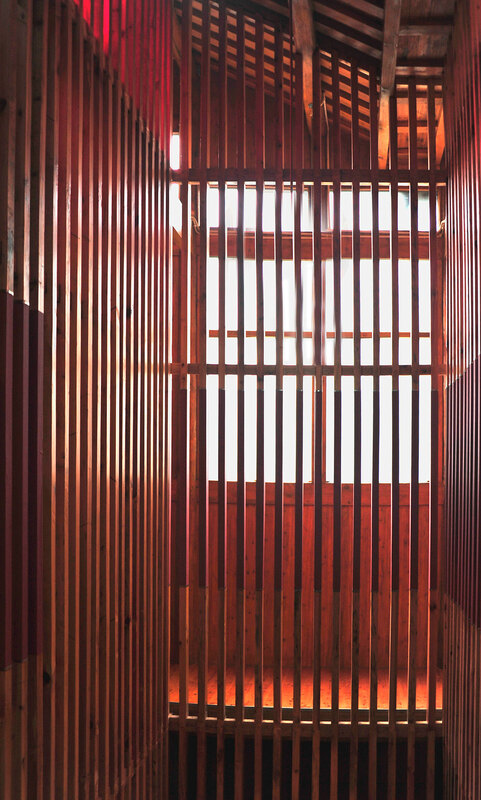 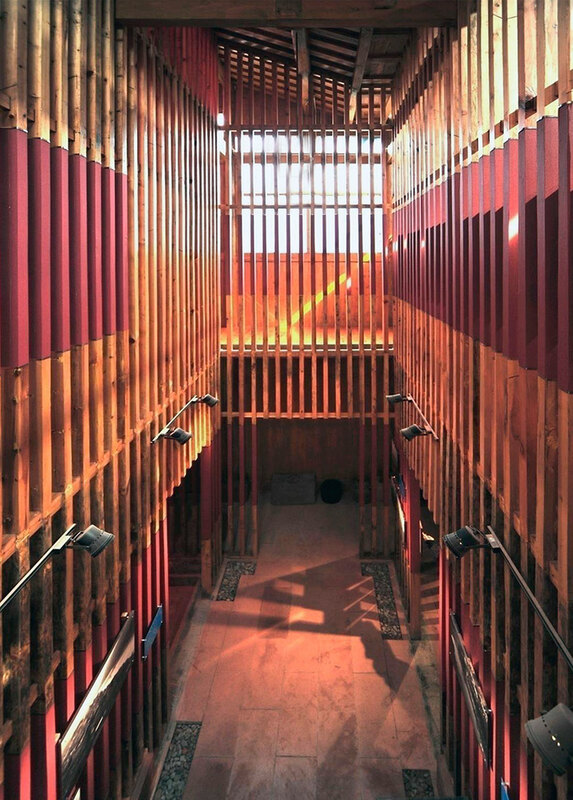 The Memorial Hall aims to hide between all the other wooden houses of Bing’an, creating inside a new and contrasting experience. 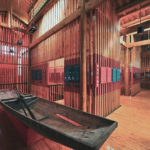 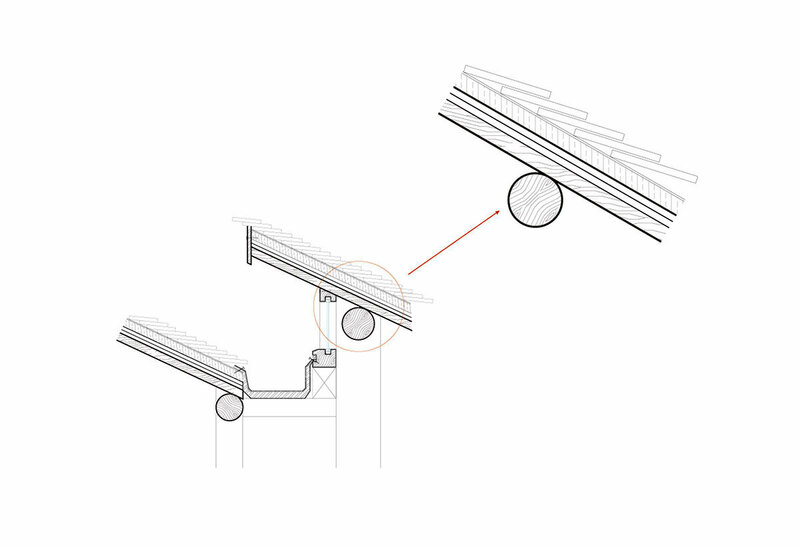 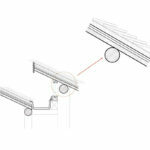 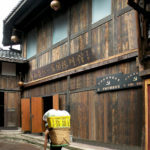 The tenon-and-mortise structure (the main supporting system uses pine tree while the other parts are built with cedar wood) has been generally applied for anchoring vertical and horizontal wood, while wooden grafts are recycled from the old building in ruins. 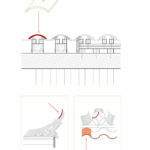 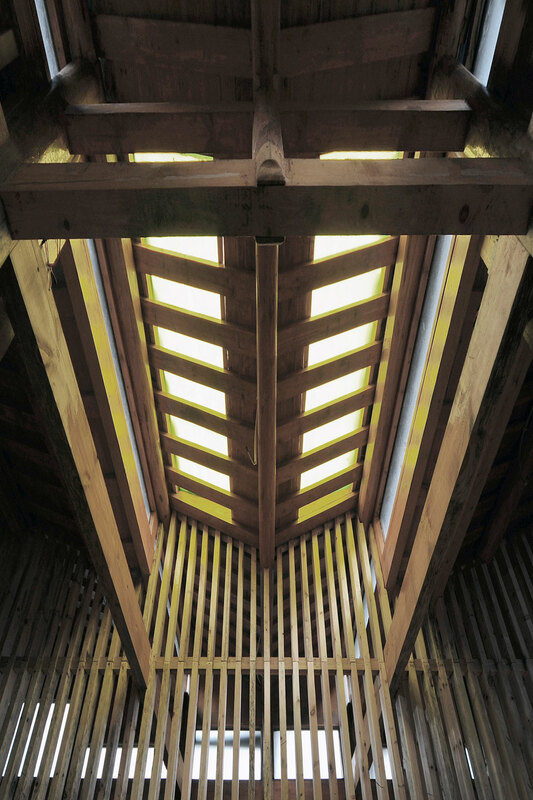 Outer walls use 12mm thick wood layer for both side together with 30mm insulating layer. 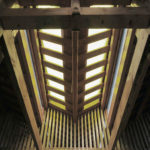 Outer wooden panels are recycled from the old original building. 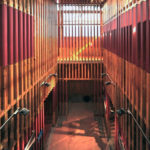 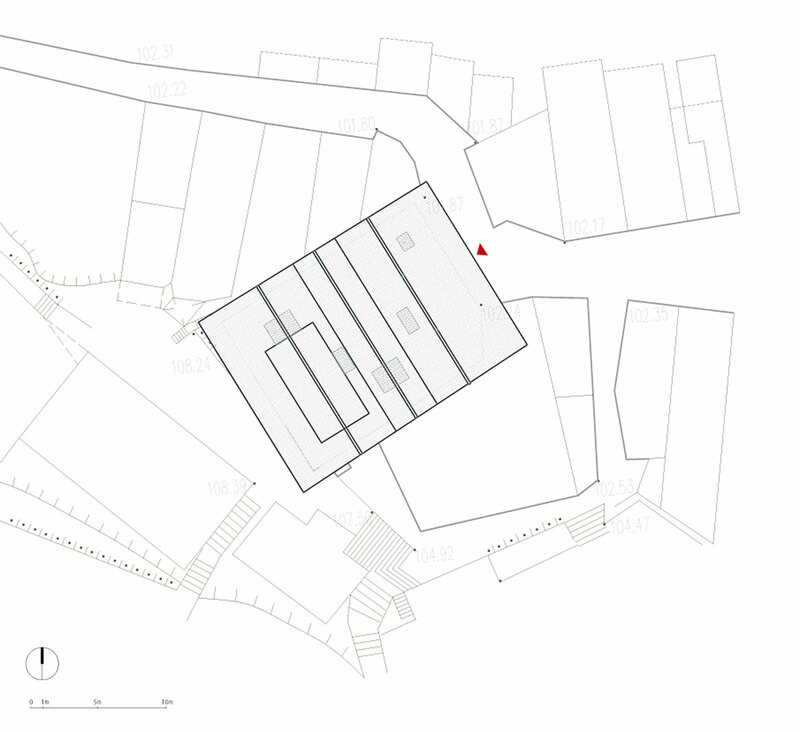 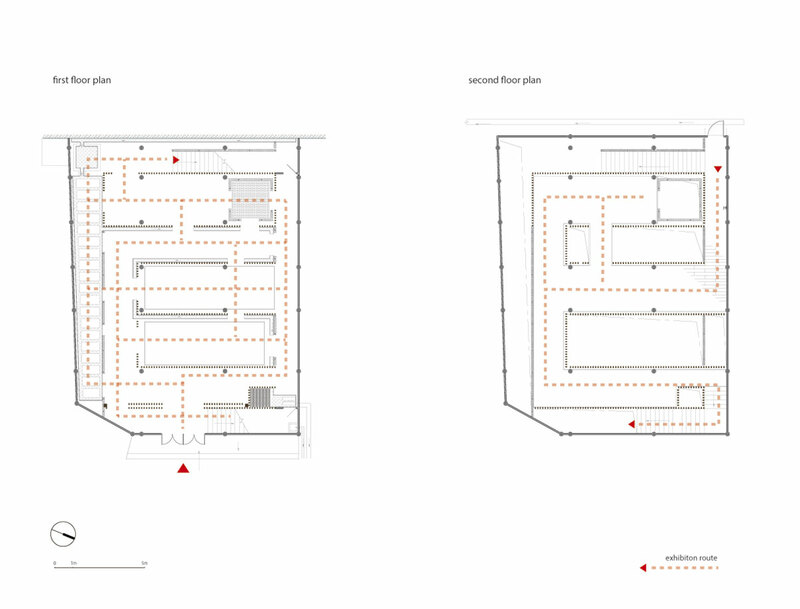 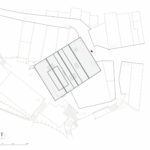 In order to avoid the typical ‘boring’ atmosphere which usually characterized memorial halls, architects tried to read history through the architectural space. 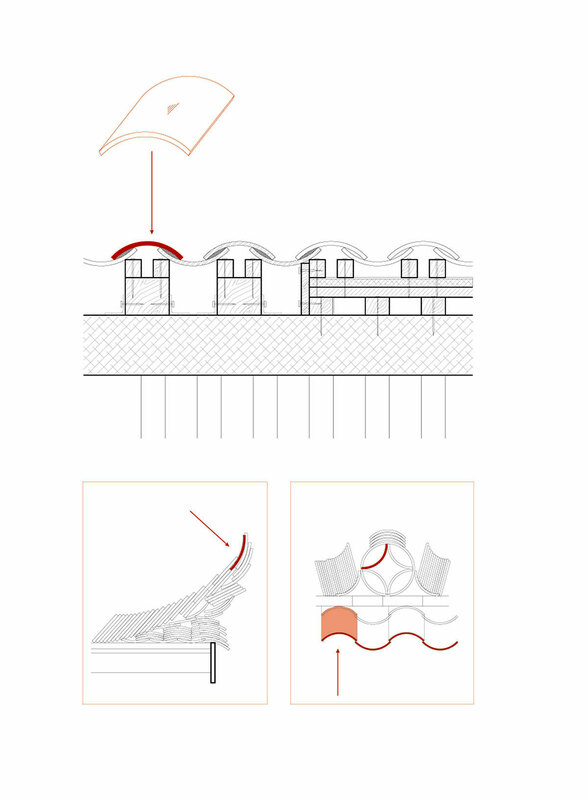 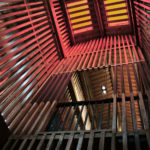 A dense assembly of vertical wooden sticks creates a strong atmosphere, emphasized by the roof lighting system. 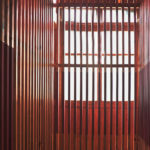 All those wooden lines ‘zoom’ the space in unexpected ways, screening and opening views along the exhibition route. 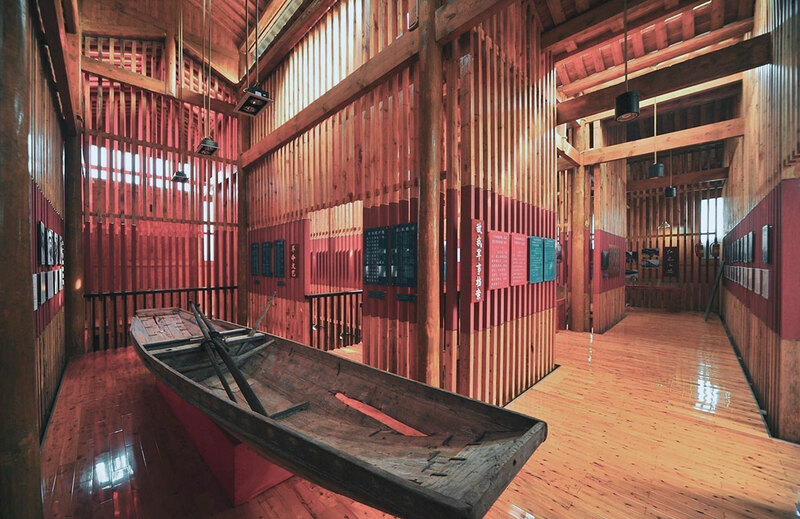 In contrast with the wooden architecture outside, this forest of lines creates a new order inside, where to display pictures and original documents. 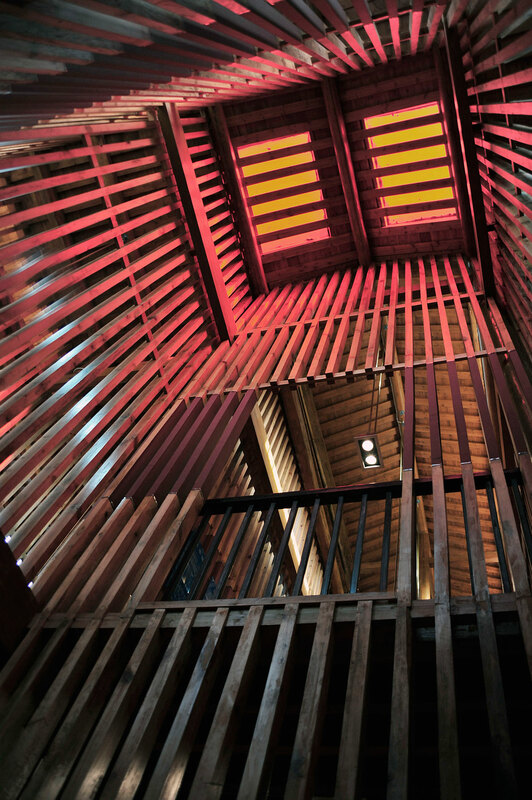 The dramatic use of colored lights coming from roof windows creates a bright/dark/bloody atmosphere, where the light, together with the obsessive presence of wooden lines, marks the space remembering what ‘red memory’ is. 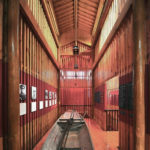 Cite this article: "Bing’an Red Memorial / West-line-studio," in ArchEyes, December 14, 2016, http://archeyes.com/bing-red-memorial-west-line-studio-2/.